Russian President Vladimir Putin joined the top teams on the ice of the 2016 World Hockey Championship to personally congratulate them on their wins and present Canada with the cup for defeating Finland and grabbing the gold. 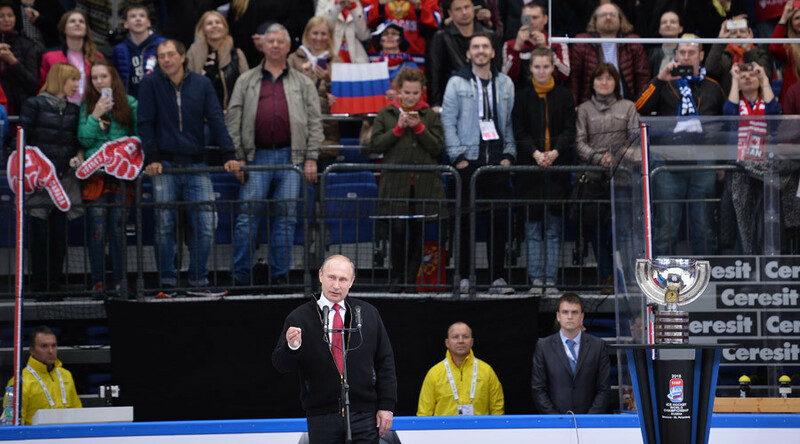 Putin arrived at the Moscow sports venue during the third period to watch the final stages of the game. “I thank Canada for giving the world this brilliant, extraordinary sport. I also thank Finland’s team for their beautiful, talented play,” President Putin said at the awards ceremony. Putin addressed the Russian team as well. “I also congratulate our Russian team with their bronze medals. I know that their fans hoped for a better outcome. But sport is sport, hockey is hockey, our men played with full commitment; they’ve shown themselves well and I congratulate them heartily,” he added. This marked the 26th ice hockey world championship win for Canada, the second best record in the history of the Ice Hockey World Championships. The first spot is still held by Russia, with 27 victories, combined with the wins of the Soviet national team.